This article is about the Shy Guy with the knife-shaped pogo stick from Super Mario RPG: Legend of the Seven Stars. 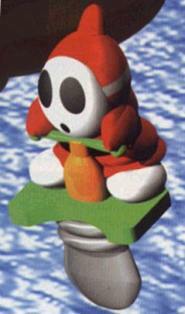 For the pogo stick-using Shy Guy from Yoshi's Story, see Shy Guys on Pogo Sticks. "Bodyguard" redirects here. For information about Rabbid Mario's technique from Mario + Rabbids Kingdom Battle, see Mario + Rabbids Kingdom Battle § Main Heroes. A Shyster is a small Shy Guy that hops on a sword-tipped pogo-stick. They appear in Super Mario RPG: Legend of the Seven Stars. Shysters seem to love nothing more than hopping around all day long. In Super Mario RPG: Legend of the Seven Stars, Shysters are soldiers that work for the Smithy Gang. Shysters formed the bulk of Mack's forces during his invasion of the Mushroom Kingdom. After Mack conquers the peaceful kingdom, the Shysters are allowed to terrorize the townsfolk as they please. A Shyster attacks by jumping on top of his opponent with his sword-tipped pogo-stick. Additionally, Shysters have limited proficiency in magic. As such, Shysters can use the weak fire-based attack Drain to shoot a small fireball at opponents. Shysters can be easily defeated with lightning magic. During Mario and Mallow's battle with Mack, the knife monster summoned four Shyster Bodyguards to aid him in the fight. After Mario's penultimate fight with Smithy, a Shyster (perhaps a Bodyguard), an Aero and a Drill Bit ask their master to calm down and to stop slamming the floor with his mallet in order to prevent the Factory from falling apart. Their efforts fail as Smithy continues to slam the foundation with his hammer, collapsing the floor and sending his minions flying away. Several stronger varieties of Shysters exist, including the Springer and the Shyper, as well as the Bodyguard and the Machine Made Bodyguard. Bodyguards are a variety of Shyster that act as Mack's personal guards. They resemble normal Shysters, except they have slightly different stats and they don't give out experience points or coins when defeated. They still can be destroyed with lightning magic, although they are more resistant to magic damage than their normal counterparts. When Mario first arrives in the throne room of Mushroom Kingdom castle, he is confronted by six Bodyguards and Mack himself. Two of the Bodyguards attempt to attack Mario, but they are deflected away by the plumber. The four remaining Bodyguards and Mack then attack Mario, beginning the battle for the first Star Piece. During the fight, Mack will sometimes jump off-screen, not returning until Mario has defeated all four Bodyguards. Mack also has the ability to summon four more Bodyguards after all the originals have been destroyed, and will repeatedly do so especially when he is low on HP. Mario cannot win the battle until all remaining Bodyguards are eliminated, even if Mack is defeated. After Mack is destroyed, the two remaining Bodyguards originally deflected by Mario will leave to inform Smithy of Mack's demise. Bodyguards are also one of the few generic enemies made into Machine Mades at Smithy's Factory. Shineitai Pun on "Heiho" and "Hyper". Shyster's name, in addition to being a pun on "Shy Guy," is likely derived from the actual term "shyster," which really means "conman." The official Super Mario RPG: Legend of the Seven Stars strategy guide placed an image of a Shyper where a Shyster should have been. This page was last edited on July 8, 2018, at 11:48.